A poster produced by the Lincoln Square Business Improvement District beckons Fashion Week attendees to spend money in neighborhood businesses. UPPER WEST SIDE — Many local businesses are rolling out the red carpet for the flood of fashionistas expected to hit the neighborhood for Fashion Week next month, but a few holdouts say they refuse to give Lincoln Center-bound celebrities and models any special treatment. "Bruce Willis comes in all the time and the only special treatment he gets is not being asked for autographs from the bus boys," said Jackie Singer, a manager at P.J. Clarke's restaurant on Broadway and West 63rd Street. "We don't want to be a hot spot. We want to be a friendly place. We don't want to intimidate families from Ohio," Singer said, adding that while the restaurant is excited about fashion week, they pride themselves on giving the same treatment to all of their patrons, famous or not. Designer Rachel Roy is scheduled to attend a Wednesday night panel discussion on fashion careers aimed at young people who live in public housing. Others said they'll take whatever Fashion Week spillover they can get. Area restaurants are planning to offer free desserts or appetizers to lure the fashion crowd out of Lincoln Center and into area businesses when Fashion Week rolls into the neighborhood Sept. 9. Josephina restaurant on Broadway and West 63rd Street even plans to hand out a free glass of champagne to Fashion Week attendees. Josephina floor manager David Jones said the restaurant plans to be fully staffed in anticipation of a busy week. He said he expects a lot of large groups who will want to sit outside and share plates. City tourism officials say they're hoping the visitors boost a new neighborhood's economy, during the first year since the Fashion Week tents moved from Bryant Park to the Upper West Side. "The city says direct visitor spending is $233 million for each Fashion Week and hopefully some of it will be spent in Lincoln Square," said Monica Blum, president of Lincoln Square Business Improvement District. Blum said neighborhood businesses are hoping to feel a "halo effect" from Fashion Week, a marathon of runway shows that display clothing designers' spring collections. In past years the event has been held at Bryant Park. It's expected that Fashion Week will bring more than 100,000 people to Lincoln Center, Blum said. "My objective is to get them outside the tents and into the street and into the shops. You can't eat all your meals at Lincoln Center. Hopefully they'll come across the street," said Blum. 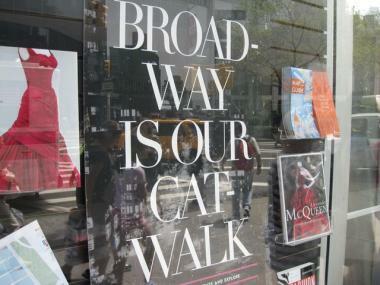 The BID is asking businesses to display posters with the slogan "Broadway is our Catwalk" to encourage Fashion Week ticketholders to venture into the neighborhood. The BID will staff information carts with maps and guides to neighborhood stores and restaurants, Blum said. Barnes & Noble will host two fashion-related events during Fashion Week. On Tuesday Sept. 13, fashion photographer Nigel Barker, known for his appearances on "America's Next Top Model," will plug his book "Nigel Barker's Beauty Equation: The Art Behind the Science of Beauty." On Wednesday Sept. 14, the store will host a talk and book signing by stylist Monica Diaz, author of "Seven Days to Style." Fashion Week's organizers are also hosting an event meant to benefit neighborhood residents: a panel discussion about careers in fashion aimed at young people who live in public housing. The panel is scheduled for 6:30 p.m. to 8:30 p.m. Wednesday night at the David Rubenstein Atrium at Lincoln Center. Designer Rachel Roy, whose clothes have been worn by first lady Michelle Obama, will be among the speakers. Jane Keltner de Valle, an editor from Teen Vogue, is also scheduled to speak, so is Audrey Smaltz, a former commentator for Ebony magazine's Fashion Fair fashion shows. Most of the attendees will come from Amsterdam Houses, the public housing high rises just west of Lincoln Center, said Sheila Stainback, spokeswoman for the New York City Housing Authority. "The idea was that when Fashion Week was relocated to Lincoln Center, there would be an effort to show residents that this wasn't just something going on in the neighborhood, it was something that could have an impact on them and influence their lives," Stainback said.